As the aim of the Mission Promise Neighborhood is family economic success translating to student achievement, the 20+ partner agencies are always collaborating to devise ways to best serve families. This can mean bringing services directly into the quartet of Mission schools served by the initiative. One idea for this fall was to tackle immigration issues head-on. 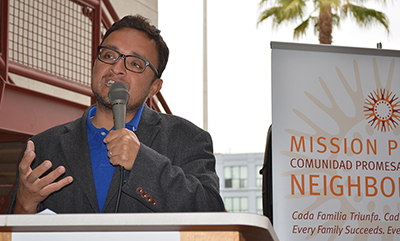 This meant La Raza Centro Legal — the Mission Promise Neighborhood’s trusted legal partner — was chosen to lead immigration “mythbuster” information sessions. 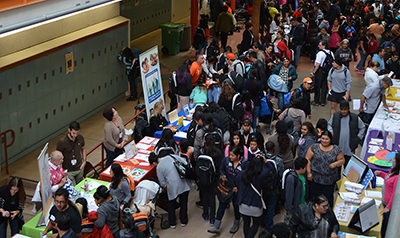 This community-based organization has a mission to “empower Latino, immigrant and low-income communities of San Francisco to advocate for their civil and human rights.” An advantage of having La Raza Centro Legal take part is that families are given the opportunity to sign up for consultations right on the spot and can have their questions answered. With 85 percent of respondents claiming they were foreign born when asked during the Spring 2016 Mission Promise Neighborhood survey, the need for such information sessions is great. “We know it’s really important to combat the misinformation in the community. We especially don’t want our families to be taken advantage of based on their fear. We don’t want them going to notarios, who charge fees and may not be able to provide our families the services they need,” explains Mission Promise Neighborhood Family Success Coach Manager Amelia M. Martínez C.
Starting a few weeks back through mid-November, the immigration workshops will be held at the schools, at times convenient for parents’ schedules. Imagine being new to this country … as an 11-year-old. You need to learn the language. You need the learn the culture. You need to just learn, period. To make this process interactive and fun, Streetside Stories and classroom teachers have partnered up to get creative. On Tuesday at Everett Middle School, 6th-graders who are newcomers to the U.S. were excitedly working on transforming narratives into digital form as a science project in Ms. Bautista’s English Language Development (ELD) Science class. A six week, step-by-step process fosters the creation of the final product: a personalized ebook titled “How Do We Survive in our World?” Students must write a narrative, design a storyboard, create images, record voiceovers and edit the final cut. Ms. Bautista co-developed the curriculum with Streetside Stories’ Van Nguyen-Stone (photo, top). Students develop literacy and arts skills, and begin to close the digital divide. For more than a decade, Nguyen-Stone’s work has encompassed independent filmmaking, complemented by teaching video production for nonprofit organizations. Through their collaboration they also cultivate young people’s voices, using compelling storytelling that values diversity and builds community. 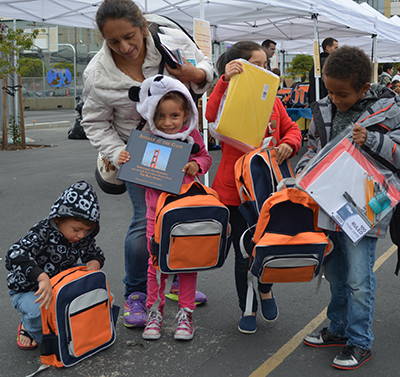 Streetside Stories, a valued Mission Promise Neighborhood partner, is up to this challenge and has been succeeding. A recent National Endowment for the Arts study found that African American, Latino and low-income youth receive significantly less arts education than white and higher-income youth. Streetside Stories is working to close this gap. Their core programs comprise innovative arts workshops that improve literacy via the integration of tech. The programs are aligned with state Visual and Performing Arts (VAPA) standards per the California State Board of Education, as developed by the Instructional Quality Commission. 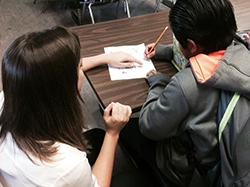 Streetside Stories’ programs are also aligned to Common Core language arts standards for the state of California. While Common Core guides what students need to know and be able to do, the curriculum defines how students will learn it and is designed by school districts and teachers. Students in Ms. Bautista’s class will share their final work with peers, families and community members on December 17th. At this event, Everett’s first iBook library of student’s ebooks will be displayed. The middle schoolers will read from their ebooks and describe their creative process via a Q & A session. Mission Promise Neighborhood (MPN) Education Manager Laura Andersen (photo, left) was on hand today to watch this project come to life. A former kindergarten teacher, Andersen enjoyed helping students practice their oral language skills and think through their ebook content. Michelle Reiss-Top (photo, top right) definitely understands the aforementioned quote about data. MEDA’s technology and data systems manager was tasked with implementing and optimizing Salesforce internally–a Herculean task by itself. Imagine then being asked to do so for a cadre of neighborhood partners. Good thing Reiss-Top showcases over 12 years experience implementing systems and making processes more efficient, user friendly and economical. This is complemented by her experience in the nonprofit and human services arena, with a focus on bringing innovative technology to the service providers of San Francisco’s Mission District. 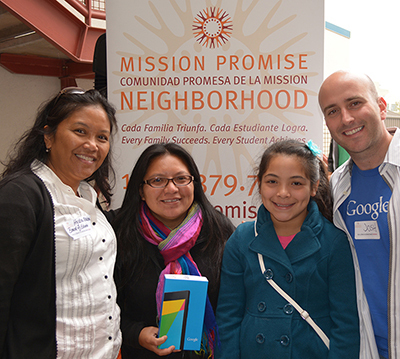 The latest challenge for the Salesforce expert was to bridge the data-collection gap among service providers of the Mission Promise Neighborhood (MPN), a citywide community partnership with the goal of ensuring that every Mission District family is economically prosperous, and that every child succeeds in school and graduates from college. MEDA serves as lead agency of this federal initiative. Reiss-Top was aware that there was no cookie-cutter application for data sharing among 11 MPN partners. MEDA Evaluator Elisa Baeza had the laborious assignment of standardizing partner data she collected. These data were in Excel files, but no style guide had ever been created, leading to fellow MEDA Evaluator Severin Saenz having to always clean up files for consistency (e.g., dates being entered in a consistent manner). The information would then be sent to the U.S. Department of Education, with the biggest drawback being that partners would never see what other organizations were doing and which clients they were jointly serving. The good news is that with the completion of this intensive, four-month project, consistent data collection has become a reality. The other good news is that there are now important insights provided by these partner data that have been collected. Take the case of MPN partner Mission Graduates, which assists high schoolers in being college ready via mentorships. The organization can now see if the student’s parents have or have not accessed other neighborhood services relating to family economic success. On a grand scale, information can now be garnered on the status of approximately 600 MPN families. The MPN team can now also know how many clients are being served by multiple agencies, plus how much time these families are spending accessing various services. Later, there will be matching of these data with students’ school outcomes. There are built-in security measures to protect client confidentiality. Each partner’s data coordinator receives training at MEDA. The initial training was held last Thursday in Plaza Adelante’s computer lab. Training topics include: avoiding duplicate records; quickly replicating service records; a holistic view of a household’s services and needs; reports, dashboards and ways to request more analysis and support. As a reference tool, Reiss-Top has created a comprehensive, 44-page manual. There will later be a one-on-one training from a MEDA evaluation team member at the partner’s office, using that organization’s data. “MPN’s hope is that each organization will find synergy with a number of partners. We have 100 community member licenses for partner users of different types. A ‘light’ user, like an executive director, can access reports. A program manager can quickly communicate with the community to share resources or expertise. This is a powerful tool. The partners at our first demo clapped when they saw their services and clients on a dashboard!” concludes an enthusiastic Reiss-Top. On a nondescript stretch of Mission Street—straddling the trendier Mission, Castro and SoMa districts—is the location of the offices of Support for Families of Children with Disabilities (SFF). While this area showcases little of the historic charm for which San Francisco is renowned, inside 1663 Mission, an elevator ride away on the seventh floor, some history of a different sort is being made daily. A pioneering concept of a community of support is being built by SFF–client by client–with families helping each other become effective advocates for their children with special needs. JoAnna Van Brusselen (photo right), came to SFF as a client a few years back, later being groomed to work at this nonprofit that is a vital partner of the Mission Promise Neighborhood (MPN). 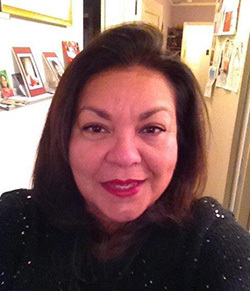 JoAnna’s background in social services in the Mission made her a natural fit. Success has definitely been achieved over the past two years, with 45 Spanish-speaking clients turned mentors under JoAnna’s auspices. Take the case of Gloria Diaz Galicia (photo left), a doting mother of three living in San Francisco’s Excelsior District, who came through the welcoming doors of SFF two years ago when her oldest son, then five, was diagnosed as having language delays. Gloria knew that her husband’s father had not spoken until he was seven years of age, so there was a possible genetic element; however, the root of the problem was secondary to immediately bettering her son’s academic experience. Gloria needed help. Help on how to advocate for her son. Help in learning how to use the correct terms to garner that assistance for her child. After seeking such help in various locales, with little success, a friend counseled Gloria to come to SFF. These rights are defined under the Individuals with Disabilities Education Act (IDEA), a federal law that ensures access to vital educational services for children with disabilities. IDEA governs how states and public agencies provide early intervention, special education and related services to the millions of infants, toddlers, children and youths with disabilities and special needs. Once Gloria was taught how to speak on behalf of her son, becoming his staunchest advocate, the youngster started to do better in school. He is now in the second grade and is on an upward trajectory. The need for SFF remains for Gloria, as her youngest son was recently determined to also having language delays. This diagnosis was made when the youngster participated in an Ages and Stages Questionnaire (ASQ) screening, which Support for Families conducts at the Mission Neighborhood Health Center (MNHC), another MPN partner. While JoAnna is gladly prepared to offer Gloria assistance again, the latter is starting at a much better point, with knowledge of how to deal with the issues in front of her. SFF continues to build a community of support—one that has kept growing day by day over the past 32 years. It’s history in the making.